Hundreds of people have demonstrated over a plan to downgrade a hospital in Nuneaton in Warwickshire. 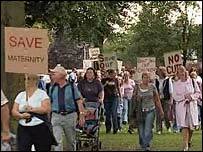 People against the proposed cuts at George Eliot Hospital marched through the town on Thursday. Under the plans, the special care baby unit could close and the children's ward be downgraded to save £7m. The hospital's trust said the changes would lead to a safer, better quality service while helping to improve hospital finances. But the protest organisers claim the hospital is being used to fill a £30m black hole in the finances at University Hospital in Coventry - which was built under the government's Private Finance Initiative. Vanessa Casey called the march "absolutely fantastic"
Vanessa Casey, of the People's Protest Group, described Thursday's march as "absolutely fantastic". She told BBC Midlands Today: "People from all area of the community have come out and supported it. "This is just the beginning. 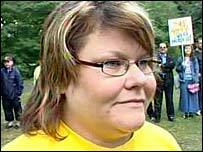 We're not going to stop until the people of Nuneaton are satisfied with their services," said Ms Casey. The £400m University Hospital in the Walsgrave area of Coventry opened last month and aims to provide health care for more than one million people.